Cookies - On DataPolarna.se cookies are used for our own statistics and to provide certain services. Do you need an expert partner? The first piece of the SawInfo puzzle was laid in 1998 as a result of a collaboration with a Swedish drying kiln manufacturer and two sawmills. Focus was at that time to give the possibility to provide traceability and quality assurance through the drying process. Since 1998 we have continuously developed SawInfo with new and improved functionality to cover all aspects of handling lumber packages in the wood industry. Today, SawInfo is a complete system with all functionality needed to handle packages in forklifts and is maybe the sharpest tool available to increase efficiency in sawmill logistics. We like ta see SawInfo as a office suit for wood industry. Around 2012 DataPolarna decided to extend SawInfo to cover even more. Since then the SawInfo-family has grown to incorporate system for production planning, production follow-up, scheduling, budget, production terminals, subcontractors and sales support. The name SawInfo works as the family name and most of the products starts with “SI”. When we started the development of the Sales Support system (SISS) in early 2017, it was also time to lift the name "SawInfo" as a family name and renamed what we called SawInfo (package management) to SIPal (SawInfo Package Logistics). Since its inception, DataPolarna has purposefully worked to "productify" our systems so that we can simplify and streamline installation, development, training, maintenance, support, integration, etc. What do we mean by ”product”? Every product in the SawInfo-family can be used stand-alone and give the customer good value. A very important part of SawInfo are integrations. Data and information shall be available at your fingertips when you need it and in many cases without asking for it. The last years we have been working a lot to make data “flow freely” between our sub systems but also between SawInfo and systems from other suppliers. As a basic principle we offer other suppliers the same API:s as we use ourselves. 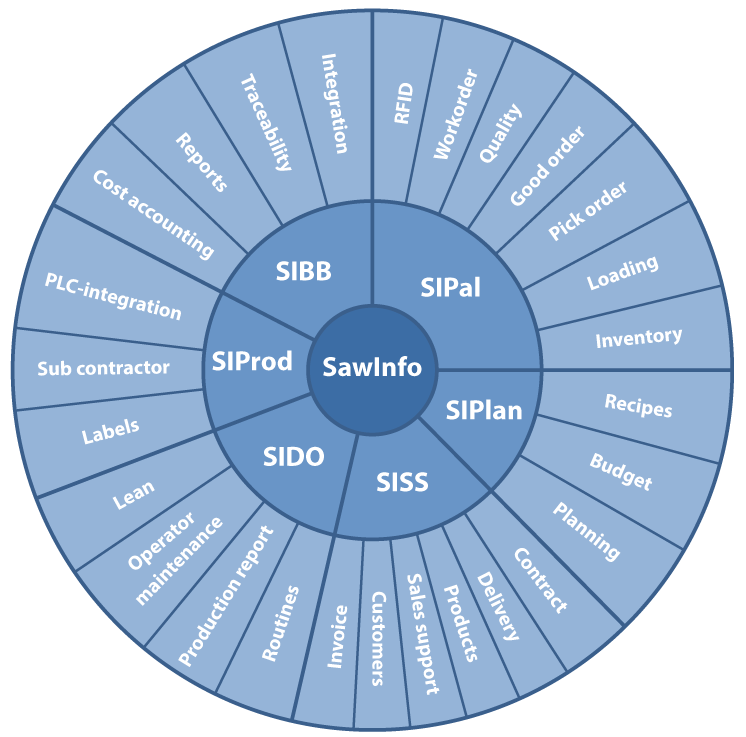 SawInfo products contains functionality for planning, monitoring, logistics and business. All available in one package. DataPolarna is a consultancy company that specialises in developing efficient, customer-adapted and innovative software solutions, as well as education and project leadership. Our strength lies in a long and broad experience of analysing needs, and of developing and carrying out both large and small projects in close collaboration with our customers. Great interest in DataPolarna at Wood Products & Technology Trade Fair! Welcome to SawInfo Days November 7-8!